The rewriting and sanitizing of history marches on. 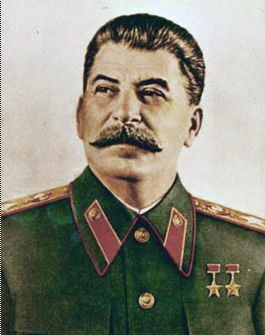 In our upside-down, inside-out world of transformation, it is no longer unbelievable that Americans would commemorate Joseph Stalin, murderer of 40 million Soviet citizens with a bust on D-Day (of all days). Where else in the free world is this supposed to be happening, if not here, where the MSM spins everything and unions run the rest? The National D-Day Memorial has added a bust of Joseph Stalin. This past Sunday marked the unveiling of a very curious bust at the National D-Day Memorial in Bedford, Virginia. The memorial’s board chose the 66th anniversary of the Normandy invasion to add a bust of Soviet dictator Joseph Stalin to accompany the busts already in place of FDR, Harry Truman and Winston Churchill. A last-minute plaque was added noting Stalin’s crimes as well as his role as a WWII ally, but critics still wonder what can justify the presence of a tyrant whose troops didn’t even play a role in the D-Day landings. William McIntosh, president of the D-Day Memorial Foundation, hasn’t been returning calls from reporters, but previously said his group merely wanted to note Stalin’s role in winning the war. That answer is not likely to quiet the furor. Stalin’s role in winning the war was accidental as he was attempting to do what Hitler was doing. A Stalin memorial? In Virginia? No joke. Stalin murdered 40 million Soviet Citizens. He imprisoned tens of millions more for such political offenses as “defeatist comments” during World War II, and for criticism of his own incompetent and cowardly conduct of the war’s early stages. Soviet soldiers were frequently surrounded by Germans early in the war, because Stalin had arrested and murdered all of his army’s competent generals before World War II began. And when the surrendered Soviet POWs were repatriated after the war, they were sent directly to Stalin’s prison camps. A ten-year sentence in the Gulag was the typical punishment for “anti-Soviet agitation,” also known as criticism of the Soviet government. Neighbors were forced to snitch on neighbors, under pain of blackmail, extortion, and threat of arrest by their own government. Political prisoners were forced into slave labor on such massive, useless public works projects as the White Sea Canal (in whose construction some 100,000 died, by conservative estimates). I want a group of us to go there in the middle of the night with sledge hammers and beat the crap out of that statue. That’s one thought – I have a better one but can’t repeat it here.